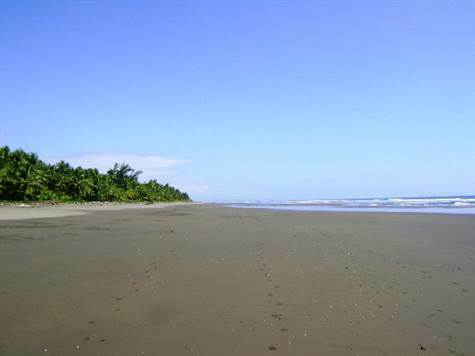 Playa Bejuco, Puntarenas – This is an opportunity for developers or builders looking for a parcel of totally flat build-able land approximately 200 meters to the beach via public road at beautiful Playa Bejuco beach. Playa Bejuco is located 20 minute drive time to the south of Jaco. The lot is just over one hectare of land at 10,075 square meters, which is approximately 2.5 acres. This area is experiencing positive growth indicators as a new project bordering this piece contains 500 single family homes as well as beachfront condominiums. Project is fully funded and 80% finished. There are also three other residential developments in the immediate area. Two of these are completely finished and the third is almost finished with its final phase. These are mainly vacation beach homes for Costa Ricans, Americans and Canadians. This hectare is located on the public beach road accessed directly from the Costanera (Hwy CR34) as you drive from the hwy to the beach at Playa Bejuco. The lot is a rectangle bordered by an urbanization of vacation beach homes on one side and a large urbanization of homes and condominiums on the North side (Malaga Properties). See picture for explanation. This property can be subdivided and maximized as in the case of the 4 very popular developments in the area. The Bejuco beach area is experiencing a boom due to its beautiful pristine beach, and location between Quepos/Manuel Antonio area, as well as Jaco. There is a new commercial center in the area as well that has now opened a gym and grocery store. This beautiful home in Playa Hermosa is located a short drive/walk/bike ride to the beautiful beach and excellent surf, restaurants and shops at Playa Hermosa and is a property with proven and increasing potential for appreciation and rental income. Even though this home is not in a “gated community” it has been successfully managed and cared for by the property management team who lives extremely close by, an arrangement which allows new owner to either be full time or part time. This is an extremely beneficial situation if you are looking for a home that is not inside a gated community but can be taken care of if you are not at home. This property has been priced to sell quickly in a strong Buyer’s Market and financing is available. This home sits on a large lot of over 1 quarter acre, with a beautiful large backyard featuring a huge, beautiful Guanacaste tree (Costa Rica’s National Tree), as well as plenty of room for expansion if needed. Property also features a small detached bodega or maids quarters as well as covered parking. This home is of very sturdy steel reinforced cement block construction, finished in teak and almendro wood. This wood is the sturdiest, weather resistant and also most beautiful of the Costa Rican hardwoods. Property features three spacious rooms, dining room and kitchen as well as two bathrooms and wrap around patio as well as all modern amenities (cable tv, internet, AC’s etc.). Please call me or write to discuss further specifics regarding this listing. 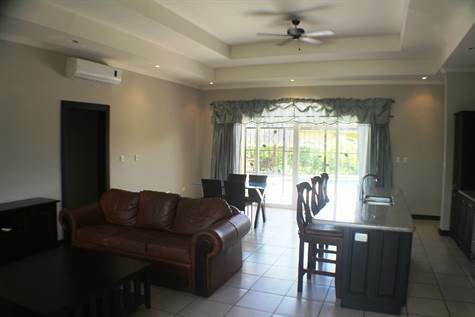 Esterillos Este, Esterillos – Another great Esterillos Area property located just a 15 to 20 minute drive south from Jaco. This property was recently reduced by a very motivated seller who will also consider financing. This property sits on a small hill overlooking a lake area in a private community with optional HOA (Home Owners Assocation) membership. Trees, flora and fauna, wildlife and spectacular bird life abound in this area. It is quiet and peaceful, uncrowded and safe, and this one acre lot adds to the value of this home. The beach at Esterillos is pristine and beautiful and it’s only one mile away. There is a beach club at the beach with swimming pool, showers, bar and restaurant, and is another major amenity for qualified members. The home itself is of excellent construction (steel reinforced concrete block, spanish tiles, custom finishes), very little drywall adds to it’s durability and climate control. It has a backyard area that abuts jungle and rolling hills as well as balconies and patio areas to enjoy the scenery. 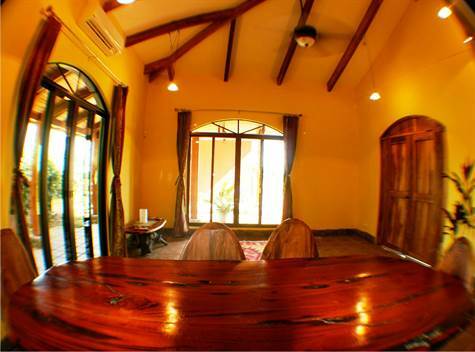 The owner lives in the home full time and takes meticulous care of the property which is in pristine condition. There is also a 2400 square meter lot (an additional half acre) for sale by the same owner. This vacant lot is next to the home and can be purchased as well for an additional price. It is possible to include the lot with the deal at a negotiated price. All services are in place, great roads, neighbors and area couldn’t be nicer. This is truly an enchanting property and at this price is an excellent opportunity to explore both as a vacation home or full time residence. Please call or write for more information, pictures etc. Jaco, Puntarenas – Welcome to Emerald Valley Estate in Jaco, Costa Rica. This new exclusive listing is just a five minute drive to Playa Jaco and Los Sueños Marina Resort, yet seems a world away in a secluded Costa Rica paradise all its own. This spacious 3 bedroom luxury home with private pool and one bedroom guest house is located on a huge 5000 meter lot (just over an acre) in a setting of natural splendor, surrounded by hills covered in lush rainforest canopy. A small river near the property and beautiful Costa Rican wildlife and flora and fauna are ever-present in this enchanting area. Main house is a spacious 4088 square feet (includes the grand outdoor patio area), with open floor plan and 12 foot ceilings to accentuate the large living room, dining room, and fantastic fully equipped kitchen with granite countertops and custom built cabinets, There is a breakfast bar, and stainless steel appliances as well. This property is sold with all appliances, furnishings and many extras. Large master bedroom has a large en suite bathroom with double sinks, Jacuzzi-bathtub and walk-in closet, and there are two guest rooms at the other end of the house, adding privacy and quiet for all. The guest house, finished in 2014, has one bedroom/bathroom, a kitchen, living room and dining area, front porch space and is a totally separate space from the main house. Current owners have been renting out the guest house with much success and are using it as rental income generator. You’ll love the huge swimming pool and BBQ deck area, done in gorgeous limestone, as well as a pool gazebo, with plenty of yard space left over for any additions or just to enjoy as wide open space. There is also a large separate bodega for the pool pump and extra storage; a full bathroom could be added as well if needed. There is a large two car garage for your cars, tools and beach toys well lit with shelving, work tables, and electric garage door. 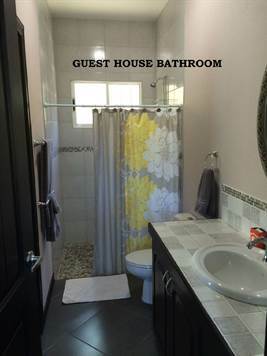 This home will be shown by appointment only. Please call or write listing agent Colin Miller, colin@jacoareaproperties.com for more details etc on this exciting new listing. Bejuco Beach, Parrita – This beautiful Central Pacific Costa Rica beach home is only 4 years old and features a custom designed floor plan incorporating a large living, dining and kitchen area as well as a covered patio area and private swimming pool. There are three spacious bedrooms and bathrooms, a one car garage, as well as outdoor private pool and rancho area that is perfect for pool parties, BBQ’s and hammock time. Home includes decorative ironwork, dishwasher, and electric stove, space saving microwave, refrigerator and washer/dryer. All furniture and appliances are included. This is an excellent value at an asking price of $285k with positive appreciation and rental income potential. This MUST SEE area is growing! There is a commercial center with grocery stores, shops, fitness center and offices less than one mile away that is nearing completion, as well as other developments experiencing resurgence in popularity due to this area’s natural beauty and proximity to San Jose. Gated community is one of the most successful and popular on the coast with low HOA fees ($200 a month) which includes gardening services. Home is within walking distance to the beautiful beach at Playa Bejuco, Central Pacific, Costa Rica (many residents use golf carts). Only 15 minutes to Jaco and 30 minutes to Manuel Antonio, Costa Rica’s most popular national park. Feel free to call or write today to discuss further.